OMNIUM GATHERUM is a Melodic Death Metal band based out of Finland. Their debut full-length album was release in 2003. Following the replacement of the original singer with Jukka Pelkonen, shortly thereafter, the band began honing their craft through five more album releases. “Grey Heavens” marks the sixth with Jukka and contains ten tracks. I have always felt that this band was one of Metal’s best-kept secrets and I would love for that to change. This is also a band that I feel have improved their sound with each new album release, and that is rare in the industry. “The Pit” leads off the assault. It’s a quick paced song with a bold and vigorous entrance and some superb guitar harmonies. The vocals are fierce as they always are and I would content that he is the best in the business at this technique. The chord progressions in the chorus usher in the splendor, and the keyboard solo section and clean vocals tie in the sweet melody and that is precisely what makes this band as special as they are. “Skyline” was the first track that I heard as the band released it a month or so ago. It’s a bit more compressed and straightforward in terms of the main riff. The lush guitar parts shine like a beacon among the fierce vocals and the keys pour over a veritable rainbow of texture, layering in pure bliss. I don’t even know to say about “Frontiers” except that it has reduced me to goosebumps. What an absolutely splendorous sound that I am having problems putting into proper words. There is no way this much radiance and awe-inspiring majesty should be able fit into one track. I would rather hear this again than take in the view from the top of Mt. Everest. “Majesty and Silence” is a slower, eight-minute song that seems to wrestle with both darkness and light throughout, where one never really takes over the other. The verses are heavy and mysterious sounding but the harmonic guitar sections are just elegant, and the haunting interludes with piano add to this spookiness. I have to say I am also very much enjoying the brief moments of clean vocals as well. “Rejuvenate” is more straight-at-you with fervor and might but the piano accents keep it rooted in delight. It would be equivalent to a monster being temporarily tamed by the doll of a small child. “Foundation” is another hearty track that combines chugging guitar parts and background keys like the dissolving of sugar into liquid for a sweet sensation. The lead guitar notes sound like wind chimes on your porch that remind you of spending your summer youth in the warm outdoors. “The Great Liberation” is thick with keyboard and piano melodies that support the barbarous vocals, which threaten to devour your soul. The elements come together in a flurry of orchestration that culminates with a super emotional ending. “Ophidian Sunrise” is a more pensive piece that has a sorrowful zeal to it with the brightness of the keyboards in the background, shimmering over the landscape in a tug and push marriage of the opposing sounds. The key change with the guitar solo is dazzling. “These Grey Heavens” is the shortest track on the album, an instrumental that opens with a pleasing acoustic and piano melody that hints of beauty to come. The main guitar riff comes in deep and thunderous and segues into a second riff that features some lead breaks that hold onto a fading evening light. “Storm Front” is the album closer. The spacy keyboards give way to a fast and furious riff with an undeniable energy and brutal vocals. There is definitely a “stormy” feeling to this song and so the title is aptly labeled. This album is exactly what the perfect follow up to the “Beyond” album should have been. 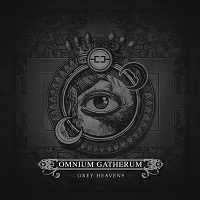 There isn’t a band around who hits the extremes on both ends of this Melodic Death Metal genre as deep as OMNIUM GATHERUM, and this album is proof. They meticulously blend elements in stark contrast together that seemingly have no place together and the sheer versatility of their compositional style is beyond impressive. Here is the metal album that will take over the genre.